Information on North and South American stock markets. You can customize your desired view by country and index using the dropdown filter. For each view chosen you can see the leading stocks for that country and index. Click on each stock to drilldown for more information about the individual stock. 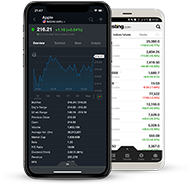 Use the tabs to find data on Price, Performance over a variety of time periods, Technical analysis summaries and key Fundamental information.